Now available as a standard building block that can easily be configured in many ways to suit your needs. The ViVa® 3mm piezo actuator is designed to replace many solenoid applications. 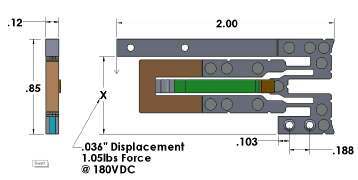 With mechanical displacement up to .039” and blocking force up to 1.1lbs this device offers an economical and vastly superior solution to the solenoid. Solenoid technology is more than one hundred years old and still exhibits many undesirable characteristics such as; high power consumption, high heat generation, non-linear functionality and slow response time. The ViVa 3mm piezo actuator is a Solid State Electromechanical device which consumes 98% less power than a solenoid in an equivalent application. Utmost reliability and superior resistance to vibration make ViVa piezo technology stand out for clean, precise, long lasting reliable service in almost any environment and applications such as: Valves, Grippers, Door Locks, Linear Actuators and Replacement of solenoids. 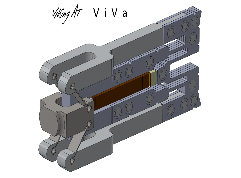 ViVa 3mm Actuator configured as 2-stage linear with two toggle arm 1st stage.